Automated recruiting makes hiring new employees easier, faster and more efficient. An automated recruiting software that completes the minuscule tasks in the hiring process allows for recruiters to focus on the larger, more important tasks. This will step up recruiting productivity. AI recruitment is able to sort through the talent pool and give companies valuable insights. The process helps find more qualified candidates faster than manual sorting of resumes and applications. By doing that, automated recruiting shortens the amount of time it takes recruiters to make a hire. AI is changing the hiring process by lowering sourcing costs, increasing recruiter productivity, improving the quality of a hire and overall bettering the candidate’s experience. So, how can an automated recruiting software help when it comes to hiring? It costs companies quite a bit in time and money when they make a bad hire. When it comes to hiring a new employee, recruiters have to filter through a lot of information, including applications and talent profiles. They need to make sure the full application has been completed and look at how their talent’s profiles, such as on LinkedIn, are filled out. On average, each corporate job offer attracts 250 applications. Out of those applicants, 4 to 6 will get called for an interview and only 1 will get the job. An automated recruiting software can successfully filter 75% of the applicants. Automated recruiting makes it easier for candidates to complete the entire application process while giving recruiters less to manually sort through. Tons of companies already use automated software, and they all agree it improves the hiring process. 75% of recruiters use recruiting software to improve their hiring process, and 94% of them say it has improved their hiring process, while only 5% had a negative experience. AI recruiting finds companies the perfect fit for the position much faster than doing it by hand. While finding that person, automated recruitment also ensures they have a great candidate experience throughout the entire process. This is important when it comes to wanting that perfect candidate to want to join your workforce. The automated recruiting software that AllyO offers is able to sort through the talent pool and give your company valuable insights to help find more qualified candidates. Implementing an automated recruiting software is the way to go to go if you’re looking to make a positive change in your company’s hiring process. 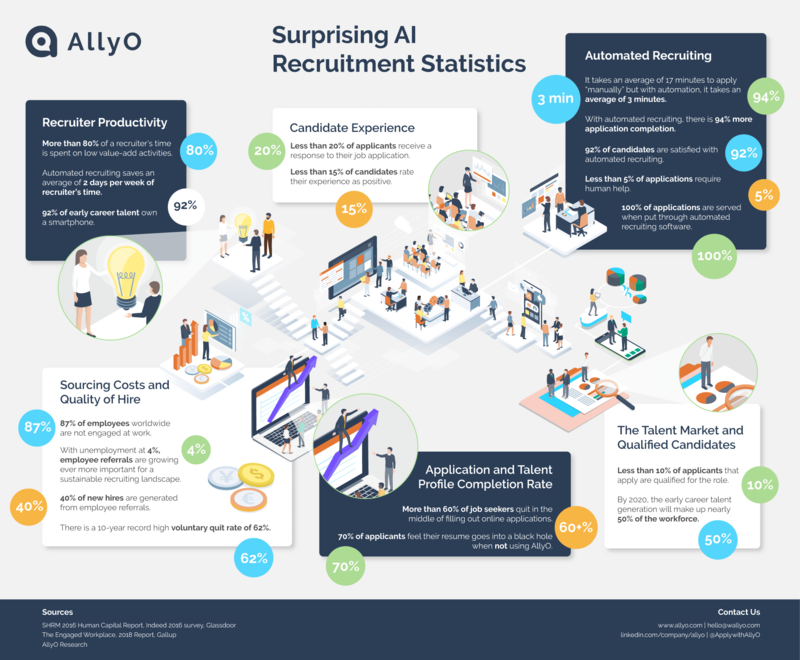 Check out this AI recruitment infographic for some surprising statistics.